Many marketers face a common problem, and it’s one of the most asked questions I hear when I’m on the road, as a speaker. 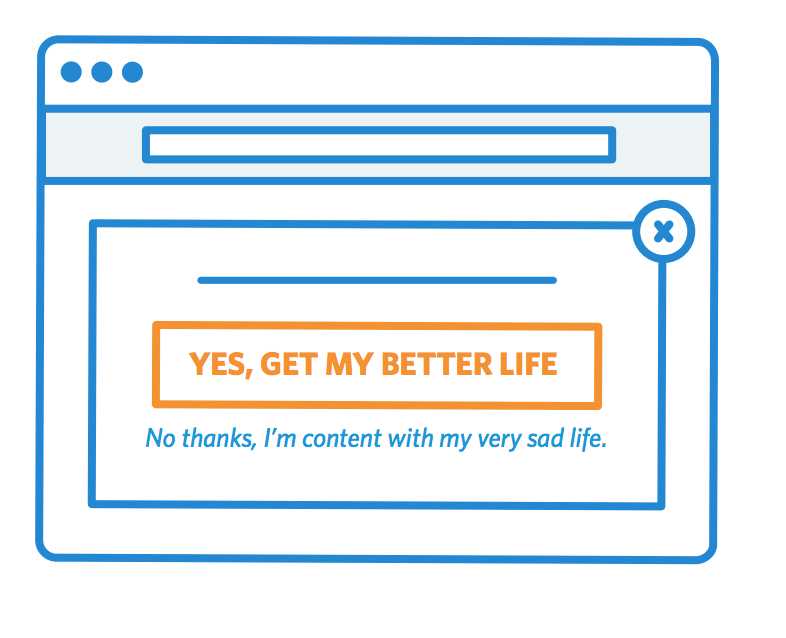 We knew at Unbounce, that we had a big challenge ahead of us when we decided to release a popup product because of the long legacy of manipulative abuse it carries with it. In fact, as the discussion about product direction began in the office, there were some worried reactions from some folks on the engineering team. They feared that we were switching over to the dark side. It makes sense to me that this sentiment would come from developers. In my experience, really good software developers have one thing in common. They want to make a difference in the world. Developers are makers by design, and part of building something is wanting it to have a positive impact on those who use it. And most important of all — it requires us to take a stance. We can’t change the past unless we lead by example. It’s been my goal since we started down this path, to make it clear that we are drawing a line in the sand between the negative past, and a positive future. Which is why we initially launched with the name “Overlays” instead of popups. It made a lot of sense at the time, from a branding perspective. Through podcast interviews and public speaking gigs, I was trying to change the narrative around popups. Whenever I was talking about a bad experience, I would call it a popup. When it was a positive (and additive) experience, I’d call it an overlay. It was a really good way to create a clear separation. I even started to notice more and more people calling them overlays. Progress. Unfortunately, it would still require a lot of continued education to make a dent in the global perception of the terminology, that with the search volume for “overlays” being tiny compared to popups, factored heavily into our decision to pivot back to calling a popup a popup. Positioning is part of a product marketer’s job — our VP of Product Marketing, Ryan Engley recently completed our most recent positioning document for the new products. Just as the umbrella term “Convertables” we had been using to include popups and sticky bars had created confusion, “Overlays” was again making the job harder than it should have been. You can tell, just from reading this paragraph alone that it’s a complex problem, and we’re moving in the right direction by re-simplifying. The biggest challenge developing our positioning was the number of important strategic questions that we needed to answer first. The market problems we solve, for who, how our product fits today with our vision for the future, who we see ourselves competing with, whether we position ourselves as a comprehensive platform that solves a unique problem, or whether we go to market with individual products and tools etc. It’s a beast of an undertaking. My biggest lightbulb moment was working with April Dunford who pushed me to get away from competing tool-to-tool with other products. She said in order to win that way, you’d have to be market leading in every tool, and that won’t happen. So what’s the unique value that only you offer and why is it important? You can read more about our initial product adoption woes, and how our naming conventions hurt us, in the first post of our January blog takeover: Why I’m Writing 30 Blog Posts in 30 Days. Let’s get back to the subject of popups. I think it’s important to look back at the history of this device to better understand how they came about, and why they have always caused such a stir. The talk I was doing much of last year was called Data-Driven Design. As part of the talk, I get into interaction design trends. I’ve included the “Trendline” slide below. 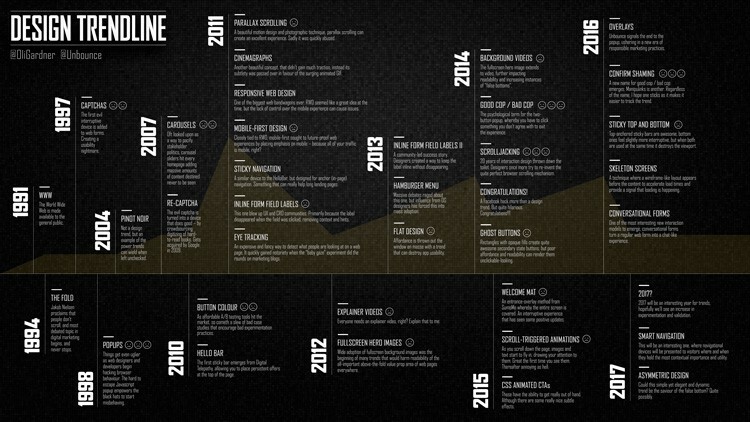 Interaction & design trends on the web since its inception. You can see that the first occurrence of a popup was back in 1998. Also, note that I included Overlays in late 2016 when we first started that discussion. Like many bad trends, popups began as web developers started trying to hack browser behaviour to create different interruptive interaction modes. I know I made a lot of them back in the day, but I was always doing it to try to create a cool experience. For example, I was building a company Intranet and wanted to open up content in a new window, resize it, and stick it to the side of the screen as a sidebar navigation for the main window. That was all good stuff. Tabbed browsers have done a lot to help clean up the mess of multiple windows, and if you couple that with popup blockers, there’s a clear evolution in how this type of behavior is being dealt with. Then came the pop-under, often connected to Malware virus schemes where malicious scripts could be running in the background and you wouldn’t even know. And then the always fun “Are you sure you want to do that?” Inception-like looping exit dialogs. We have a legacy of abuse that’s killed the perception of popups. What if Popups Had Been Built Into Browsers? Imagine for a moment that a popup was simply one of many available interaction models available in the browsing experience. They could have had a specification from the W3C, with a set of acceptable criteria for display modes. It would be an entirely different experience. Sure, there would still be abuse, but it’s an interesting thought. This is why it’s important that we (Unbounce and other like-minded marketers and Martech software providers) take a stance, and build the right functionality into this type of tool so that it can be used responsibly. Furthermore, we need to keep the dialog going, to educate the current and future generations of marketers that to be original, be delightful, be a business that represents themselves as professionals, means taking responsibility for our actions and doing everything we can to take the high road in our marketing. Technology is NOT the problem, We Are. It’s the disrespectful and irresponsible marketers who use manipulative pop-psychology tactics for the sake of a few more leads, who are the problem. We need to stop blaming popups for bad experiences, and instead, call out the malicious marketers who are ruining it for those trying to do good work.